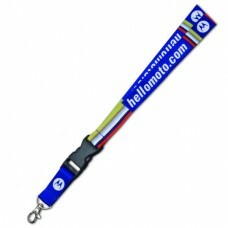 This promotional 20mm Heat Transfer Lanyard is printed with an all over heat transfer image in full colour print. Price includes a wide metal alloy hook but various other fittings and sizes are available on request. Promotional 20mm Flat Polyester Lanyards are ideally used for conferences, exhibitions or places where you need to have a pass on show. Various colour options avaiable please ask for details. Dimensions: 900mm x 20mm. Print area full overall coverage. Prices are based on 4 colour print to 1 position. The colours shown are only for guidance and cannot be taken as a true representation. Minimum order is 250 off.